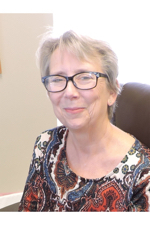 Cindy Bobbitt has joined the staff of Family Promise of Beaufort County as office manager. 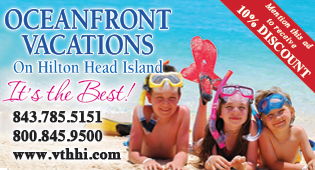 With a background in marketing, communications, and client service, Bobbitt previously worked as a licensed property manager for Miller Long Term Rentals. No. 2 Alabama women’s golf carded a final-round 289 (+5) on Sunday, March 4, at Long Cove Club to earn a wire-to-wire victory at the 2018 Darius Rucker Intercollegiate. 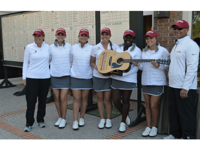 The Crimson Tide, who totaled a 54-hole mark of 866 (+14), finished atop the leaderboard for the third-straight year. 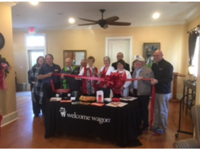 Welcome Wagon of Bluffton celebrated on March 14 with an official ribbon-cutting ceremony, introducing them to the greater Bluffton community. Pictured: Kathy Flinn, operating manager, along with colleagues, the Greater Bluffton Chamber ambassadors, CEO and board members, and Bluffton Town Councilman, Dan Wood. 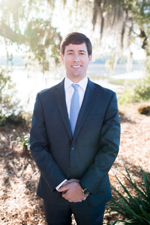 Blackwell Boyd, a private wealth management firm, is pleased to announce Edward Taylor has joined the firm as director of wealth management. Taylor joined Blackwell Boyd from Dividend Assets Capital, where he served as portfolio manager, directly managing in excess of $150 million of client assets. KML Computer Services welcome’s their newest team member Clint Cole, Network Engineer. Clint began in March at the Novi, Michigan office. 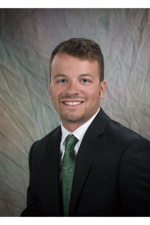 Jay Bowler has joined Oak Advisors, LLC as a client service associate. 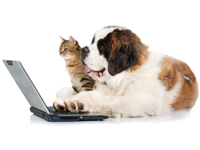 His responsibilities include assisting with client relationship management and data management support. 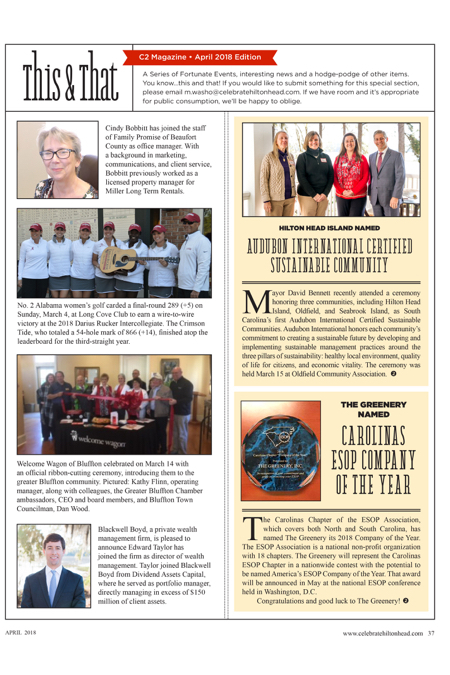 Mayor David Bennett recently attended a ceremony honoring three communities, including Hilton Head Island, Oldfield, and Seabrook Island, as South Carolina’s first Audubon International Certified Sustainable Communities. 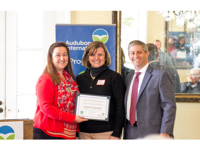 Audubon International honors each community’s commitment to creating a sustainable future by developing and implementing sustainable management practices around the three pillars of sustainability: healthy local environment, quality of life for citizens, and economic vitality. 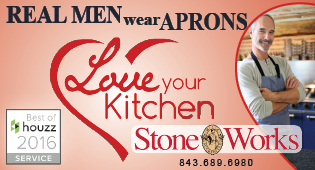 The ceremony was held March 15 at Oldfield Community Association. 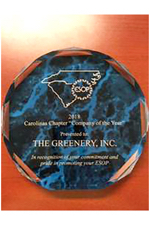 The Carolinas Chapter of the ESOP Association, which covers both North and South Carolina, has named The Greenery its 2018 Company of the Year. The ESOP Association is a national non-profit organization with 18 chapters. 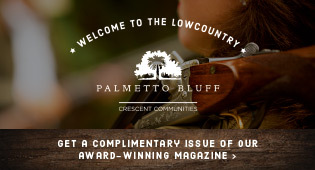 The Greenery will represent the Carolinas ESOP Chapter in a nationwide contest with the potential to be named America’s ESOP Company of the Year. That award will be announced in May at the national ESOP conference held in Washington, D.C.
Congratulations and good luck to The Greenery!